Efficient and reliable transmission of power is of the utmost importance in any drive application. Tsubaki drive chains are therefore designed to be the most accomplished on the market, bringing optimum transmission of power from motors, to sprockets and to machinery with minimal maintenance. A benefit of our decades of experience. Tsubaki drive chains are used in the world's most demanding applications, where our emphasis on quality and versatility allows us to create the perfect power transmission solution for any application. Promote efficiency, minimise downtime, maximise profitability - specify Tsubaki. 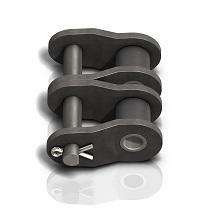 Tsubaki is proud to introduce the 4th generation, enhanced BS/DIN European premium chain. The product is available in chain sizes from RF06B up to RS48B*. Simplex, duplex and triplex executions are at your disposal. Tsubaki's Lambda Chains were the first in the industry to use a special oil-impregnated bush. The 6th generation of Tsubaki Lambda Lube Free chain is supplied as standard with NSF-H1 food grade lubricant impregnated bush, which makes it perfectly suitable for applications in the food industry. Learn about the Roller Chain Structure: the three basic dimensions, the basic parts and the assembly parts of Tsubaki Roller Chain.